Is there a requirement that a "hard" SF author can't write believable characters or dialog to save their life? Or, rather, considering the general level of education and IQ among that crowd, is it a conspiracy so that they can chortle over the nearly inevitable comment in any review of their books about the simplistic characters and amateurish dialog? Well, no matter. 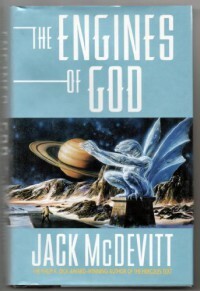 I picked up a copy of The Engines of God at a library booksale for 50 cents so I can't complain too vociferously. I knew going in I'd probably be subjected to awful dialog and simplistic characters (sigh) but I'm a sucker for books like this that try to explain why our skies aren't overrun with happily self-replicating von Neumann machines (personally, I like Alistair Reynold's answer: there's a vast cosmic ecology full of predatory machine intelligences that keep each other in check, mostly). The best I can say about this book is that it's reasonably enjoyable "mind candy."